Cross Roads Escape Games is rated the #1 best escape room in Orange County / Los Angeles, and #3 in the nation by USA Today. 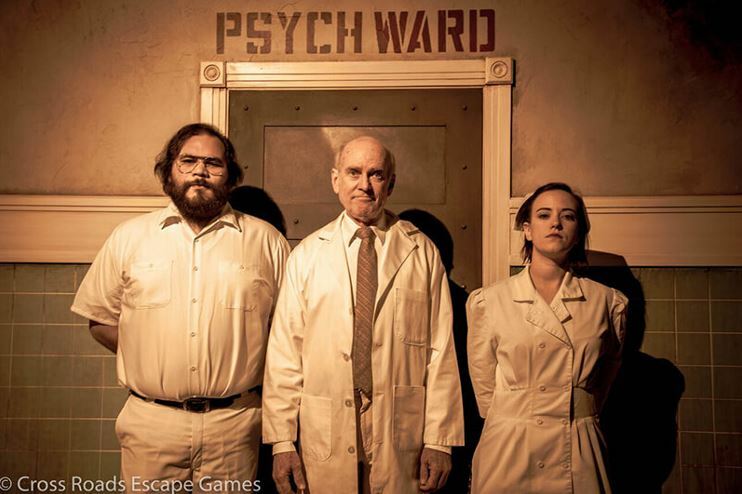 They are leaders in their industry, and we were excited to catch up with them to get some details on their new escape room, “Psych Ward.” We spoke with Madison Rhoades, Owner & Creative Director, to find out what they have in store for their new room. The Psych Ward is set in a psychiatric hospital in the early 1970s. Two teams will compete against each other in the goal of getting the most points. The catch? They don’t know who is telling the truth. This game is 60 minutes long for 5 – 8 players, over the age of 16. 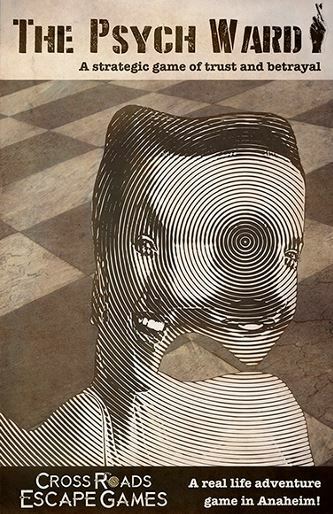 The game is not scary, but you will be placed in uncomfortable situations. This is also one of the few escape rooms that is worth playing more than once, because there is more content than can be uncovered on your first visit. Feel free to head back in and try new strategies for multiple attempts. TSF: How did you get started? MR: My husband, Luke, and I both come from a theatre background. He went to school for scenic construction and performance. I went to school for scenic design and scenic painting. When we were first introduced to escape rooms back in 2015, we instantly fell in love with them and we thought we could bring something new and up the production quality with our theatre knowledge. So we did! We opened The Hex Room in January of 2016, followed closely after by The Fun House. We then began work on The Psych Ward, but it wasn’t until two years later that we finally finished it. TSF: How would you rate the difficulty of your escape room versus other popular rooms? MR: Our games range in difficulty. The Fun House is an easy to moderate difficulty. We actually have two versions of that game, one for kids ages 8-13, and a more difficult version for teens and adults. The Hex Room is very difficult with only a 20% escape rate and there is even a bonus puzzle that advanced teams can choose to solve that only 5% of people can both complete and escape. The Psych Ward is different; it doesn’t really have a difficulty level because it is not an average escape room game. In a normal escape room, players have to solve every puzzle and escape before the time runs out. In The Psych Ward, players can solve as many or as few challenges as they need in order to win, and every game is an hour long. The difficulty really depends on who you bring with you to play. TSF: Do you build your own props and/or special FX? If not, who does? MR: Yes, we do build everything ourselves, that is our specialty. Although for The Psych Ward, because it was such a big project, we did reach out to other companies to help us with programming and fabricating a few mechanical props. TSF: Where do you see escape rooms in 5 years? MR: I really hope with The Psych Ward, designers start to see that escape rooms can be more than just escaping a room. Escape Rooms have a great business model of bringing people together and making them feel like the stars of their own movie. To be honest, Luke and I have done over 200 escape rooms together, and we are getting bored. It doesn’t matter if you are escaping jail, robbing a bank, or disarming a bomb, they are starting to blend together and become the same. I really hope that more escape room companies start becoming inspired by other great entertainment like immersive theatre, VR, amusement parks, and board game so they can start changing the game up and making something unique. TSF: Which of your most recent changes are you most proud of? MR: Luke and I are very proud of The Psych Ward. What we set out to do, many people told us was impossible, but we feel like we did it. We wanted to make a game that was re-playable, for all experience levels (first time players and enthusiasts), and we wanted to combine our love of immersive theatre, escape rooms and board games. It was a lot of work, it took well over two years to conceptualize, build, and test, but we did it, and the response we have been getting has been overwhelmingly positive. People are always looking for something new and unique, and I am glad we were able to bring that to them. Ages: 16 and up with a parent or guardian’s permission. Run: Wednesday – Sunday. All year long.